UTORDA: Two goals on either side of half time helped FC Goa secure a 2-0 victory over Dempo Sports Club in the All India Football Federation’s U-18 Youth League, match at SAG ground, Utorda, on Thursday. FC Goa led 1-0 at half time. They were the aggressors in the first half, dominating ball possession for the most part. The Gaurs tested the goal with a shot from Brison Fernandes in the 4th minute of the game. That attempt, however, was straight on goal and made for a comfortable save for Wellyster Mendes in the Dempo SC goal. Wellyster wouldn’t have it so easy a few minutes later. A beautifully weighted ball from Brison in the 19th minute sliced open the Dempo SC defence, playing in Meuton. The young forward made no mistake in slotting the ball into the back of the net, lifting the ball over the onrushing keeper. The second 45 minutes saw both sides going hammer and tongs at each other’s defence. The contest started to become feisty towards the later part of the half. However, the Gaurs’ nerves were calmed down thanks to a brilliant goal from Sweden on the 79-minute mark. The winger controlled the ball near the centre line on the right hand side of the field, held off the attention of a couple of defender before going on a breath-taking run. 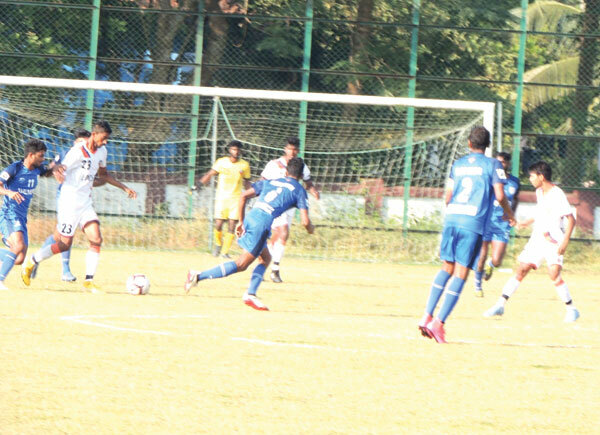 The youngster rocketed down the right wing before cutting back and slaloming through the Dempo SC backline. Having left four defenders for dead, Sweden showed maturity beyond his years to keep his composure and caress the ball beyond the keeper and into the net. A minute before long whistle, Substitute defender Deepraj Govekar of Dempo SC and FC Goa defender Aniket Singh Thakur were ejected by Referee Sharad Naik for violent conducts. The win, FC Goa’s third, helped them secure 11 points after six matches. They remain third in the table for the Goa region with Salgaocar FC and Sporting Clube de Goa above them. The young Gaurs will have a chance to overtake Sporting Clube when they meet in their next game on December 11.